On Sunday 4th of August the Royal Dutch Rowing Federation (KNRB) participates, together with TopRow, for the second time with a boat at the Canal Pride in Amsterdam. 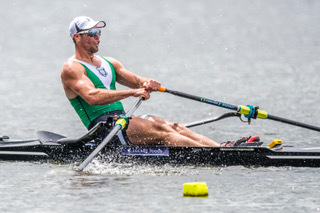 In the run-up to this event, TopRow will publish a number of articles on this subject, starting with an interview with world record holder in the single scull, Robert Manson (28), who in 2014 openly proclaimed to be gay. Your coming-out was just before the 2012 Olympic Games in London, in 2014 it was only massively picked up by the media. Was it a deliberate choice to do so? “Yes, pretty much. I have written a story about my coming out and published it. That was picked up everywhere. Mainly I wanted to share my experiences about how limited and terrifying the thought of coming out felt. Do you think that your coming-out has affected your rowing performance? Do you consider homosexuality being sufficiently accepted in the rowing world? And do you think that it is different in rowing than in other sports? Do you believe that the World Rowing Federation FISA is doing enough in this area? There is already a Women’s Committee, but should they engage more in activities promoting diversity? What do you think of the initiative of the Royal Dutch Rowing Federation and TopRow to be participating during the Canal Pride?